Beta Wife’s latest baking creation is one of my new favorite breakfast items ever in the whole world. With cherries coming into season, we’ve received a few pints from our CSA and, aside from some initial cocktail experimentation, all these delicious fresh cherries have really only had one purpose: streusel-topped muffins. I mean, muffins themselves are fairly boring baked goods. I don’t exactly jump up and down when I see muffins in a bakery. But these muffins…these muffins are special. When I said, “Beta Wife, I’d like some cherry muffins,” I was not expecting moist, fruity cake-like nuggets of baked bliss. And though the wife was reluctant to part with her magical recipe, I persuaded her that we could change thousands of lives. You’re welcome. 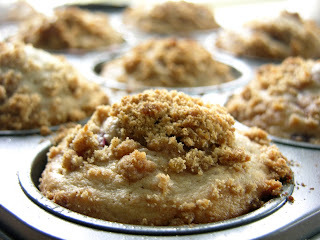 For the streusel topping, mix the dry ingredients in a small bowl, then cut in the butter until coarse crumbs form. You can do this with your fingers, no problem. 1. Pre-heat oven to 400°. Line a muffin pan with cups or grease lightly. Set aside. 2. In a medium mixing bowl, combine flours, sugar, baking powder, salt, and cinnamon. Make a well in the center and set aside. 3. In a separate bowl, combine the beaten egg, milk, oil, and vanilla & almond extracts. Add this to the dry mixture, stirring until just moistened (batter will still appear slightly lumpy – don’t worry!). Stir in the chopped cherries. 4. Spoon the batter into the muffin cups until each one is 2/3 full. Add streusel topping. Bake at 400° for about 17 minutes. Keep a close eye on them – they’re best if they don’t overbake. 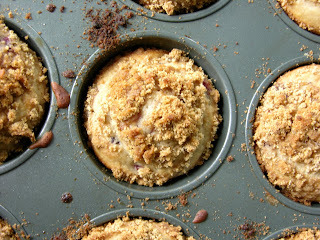 I love anything with streusel - throw in some cherries and I'm really happy! Every time we get more cherries, I request these muffins. I never even used to like cherries. Streusel changes everything.